The news, while perhaps not unexpected, was not good for Toronto FC on Wednesday. An independent panel upheld referee Chris Penso’s decision to issue a red card to Altidore for violent conduct, rejecting Toronto’s appeal. The decision means both of Toronto’s star strikers are suspended for the Nov. 21 start of the Eastern Conference final in Columbus. Sebastian Giovinco got a one-game ban after picking up two yellow cards — for time wasting and dissent — over the two-leg conference semifinal win over the New York Red Bulls. 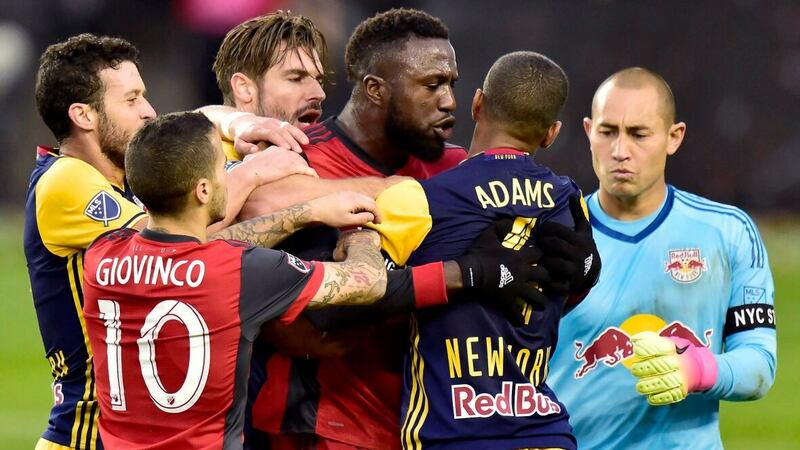 Altidore and Red Bulls captain Sacha Kljestan were ejected after the two teams clashed in the BMO Field tunnel at halftime of Game 2 of the semifinal Nov. 5. Both teams appealed their red cards with Toronto saying its security camera footage showed their man was not at fault. There was no immediate word on the Red Bulls’ appeal of the incident. The three-person independent panel is made up of representatives from the U.S. Soccer Federation, the Canadian Soccer Association and the Professional Referee Organization. Each MLS club is entitled to two unsuccessful appeals per season, including the playoffs. Altidore, who had expressed confidence that the video would vindicate him, did not speak to the media Wednesday. Vanney described him as frustrated. The incident may not be over. Both Altidore and Kljestan could face supplemental punishment from the league’s disciplinary committee, which is comprised of three former MLS players, one former MLS coach and a former MLS referee. Altidore and Kljestan had words late in the first half after Altidore went to the defence of Giovinco, who was facing up with Tyler Adams. Kljestan ended up shoving Altidore, who toppled — somewhat easily — backwards. “Disappointing, for sure,” captain Michael Bradley, speaking in an interview with TSN radio, said of the failed appeal. They took 45 per cent of the team’s shots (196 of 440) and 49 per cent (82 of 168) of the shots on target. The duo also handled eight of TFC’s 11 penalties this season. On the plus side, Toronto routed Columbus 5-0 at BMO Field on May 26 without Altidore (suspended) and Giovinco (injured). Barring a ruling by the disciplinary committee, both strikers will be back for the second leg against Columbus at BMO Field on Nov. 29. Toronto will likely start Canadian international Tosaint Ricketts (seven goals) up front in Game 1 with Spanish playmaker Victor Vazquez (eight goals) playing farther forward.